Difference between revisions of "Working with GMail"
Congratulations, now you can fully send and receive mail through '''Kontact'''! This is a new page, currently under construction! These instructions are only valid for the latest release of kdepim and Korganizer, version 4.3.7. There are significant differences in the older versions, therefore, some instructions may not apply. 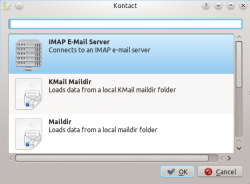 This tutorial will allow you to setup IMAP forwarding from a Gmail account to Kmail, which can be accessible through Kontact. For the purposes of this tutorial, my email will be sync.with.kontact@gmail.com. Firstly, you need to open Kontact. You can access it by simply typing its name in the search bar. Now, after Kontact starts up, click on Mail in the left vertical navigation bar. This brings you to the Kmail part of Kontact. To set up the forwarding options, go to: Settings -> Configure KMail. The first step is to create a basic identify, this is to separate multiple accounts in the future, if you have them. Setting up a new Kmail identity. Next, go to the Accounts tab on the left navigation bar. Here you can configure the incoming and outgoing mail accounts. 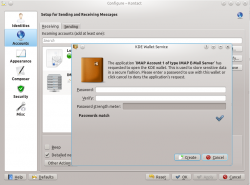 Click on Add, and then ensure that “IMAP E-Mail Server” is highlighted, and then click OK. After this, 2 prompts will come up offering integration with the KDE Wallet service. For convenience, select the option entitled Allow Always. Adding the new IMAP account. Now it is time to configure the incoming connection. Name your account Name whatever you want. 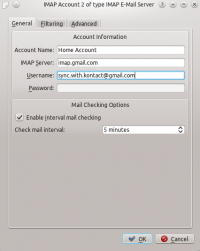 Now, enter as the IMAP server imap.gmail.com. Your Username is your email account, in this case mine is sync.with.kontact@gmail.com. The Password is the password of your Gmail account. Next, go to the Advancedtab, and ensure that it is connected on Port 993 with the SSL/TLS radio button left on. As for authentication, according to the KMail documentation, DIGEST-MD5 encryption is recommended, however for now Google’s IMAP server does not support any of this, so cleartext must be selected. Click OK. Another KDE Wallet prompt should show up, and for convenience, you can select the Allow Always option. To check your emails, find the Inbox of your newly setup account, in this case, Gmail Incoming, and press F5 to refresh and download new emails from the server. 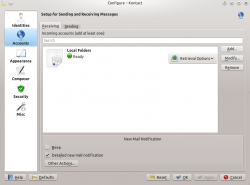 To setup an outgoing connection, similar steps must be taken to add the new connection, which is treated as a new account by Kmail. Open up the Kmail Configuration window, and go to the Accounts area in the left navigation bar. Instead of using the Receiving Tab, which was used to setup the incoming (IMAP) connection switch to the Sending tab now. Now, click on Add... and select the SMTP option and click OK. Afterwards, a Configure Account window will appear. The following details are needed by Kontact. Login: Your Gmail account. Here. it's "sync.with.kontact@gmail.com"
For convenience, check the Store SMTP password option. Now, go to the Advanced Tab of the window and enter the following information. 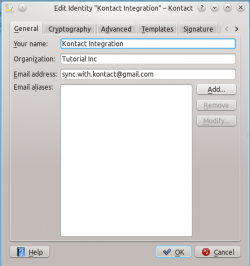 When sending your first email from Kontact, you will need to save the information in KDE Wallet once so it won’t have to be used later. Note: This animation is temporary, and will be improved in a bit. Congratulations, now you can fully send and receive mail through Kontact!